There are various different types of fire extinguishers ranging from water to wet chemicals; each and every extinguisher has its own class and suitable function which many do not seem to realise. There various classes to fires from A to F each which their own properties. This leads to some fire extinguishers to be suitable for certain types of fires that may occur. It is important for the CSCS test to know your fire Extinguishers for health and safety. All these work on different types of fires and no single extinguisher will work on all classes of fires. 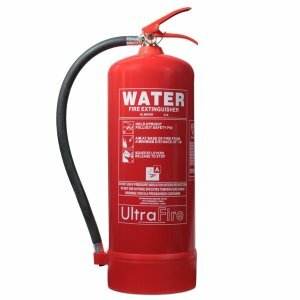 Water Extinguishers, perfect for extinguishing combustible materials such as wood, paper and textile etc. They don’t contain any damaging chemicals and coincide with the environment. They work by cooling the fire and reducing its temperature below the critical rate necessary for sustaining the fire. However, because they are water extinguishers, they can conduct electricity and cannot be used around any live electrical equipment or circuitry. A large disadvantage is that water extinguishers can only be used in class A fires which are wood and paper etc. If used on any other class fires it can cause harm to the user and make the fire worse. The water fire extinguishers are best used on fires involving organic matter such as Paper, Wood, cloth etc. Do not use on any sort of electrical items or any burning fat or oil. As the name suggests these Water mist extinguishers create a mist of microscopic water particles because they have a different nozzle type. What this will do is suffocate the fire, but it will also create a barrier between the fire and the person using the fire extinguisher, like building a wall of water, this will reduce the feeling of heat from the fire also. Like above the water spray fire extinguishers come equipped with a slightly different nozzle which creates a separate spray, rather than a jet nozzle on the normal extinguishers, this will give a greater surface coverage, and the fire can be put out quicker. 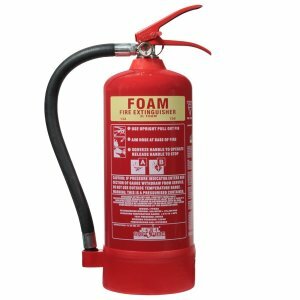 AFF Foam extinguishers are used for class B fires involving oil spills and other liquid spill orientated fires. AFF Extinguishers also have a high-class A fire compatibility which makes them very effective. Also due to their light weight counterparts makes them perfect for office use. They work by spraying a film of foam over the fire suffocating it and preventing re-ignition. They also feature the same cooling qualities as water extinguishers. These are best for fires which involve burning liquids, for example, petrol and paint. These should not be used on fat pan fires or chip pan fires. 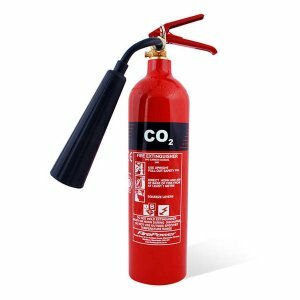 CO2 Extinguishers, essential for use on electrical fires as they are safe for electrical appliances and do not leave any residue. These extinguishers work by displacing the oxygen suffocating it to prevent combustion. They also work well with class B fires involving liquids. However, they do not cool the fire effectively and sometimes reigniting may occur. The best use of CO2 fire extinguishers is for live electrical items, and these are mainly used on large computer systems like servers. Be careful when using them in confined spaces, fumes from CO2 extinguishers can cause asphyxiation if they are used in confined spaces. Make sure they have a frost free horn as otherwise hands holding the horn can become frozen to the horn as the gases coming from the extinguishers can get very cold. ABC Dry Powder Extinguishers are useful in many fires and are excellent all round fire protection. 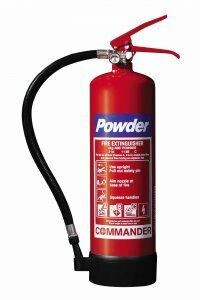 Powder fire extinguishers are the only extinguishers compatible with class C gas orientated fires. These extinguishers work by fusing ammonium phosphate with ammonium sulphate to form a barrier that suffocates and prevents re-ignition of the fire. Ultimately destroying the fire. Although the powder may also irritate the skin and eyes, it also may cause a breathing discomfort when you come in contact with the powder. They also leave a large widespread of a powder residue making it a nuisance for small fires. When using this extinguisher, it is best to stay out of contact with the produce. Dry Powder extinguishers are best used on fires which are organic liquids such as grease, fats, petrol etc or solids. They can also be used on gas fires. Wet Chemical Extinguishers are particularly designed for kitchen appliance fires involving oils and fat such as deep fat fryers. It is recommended that users be trained in the use of this extinguisher to achieve full results. The extinguisher applies cooling foam over the burning oil. This cooling foam sprays as a fine mist which extinguishes the fire and prevents re-ignition. This type of fire extinguisher is great for Class F fires; these are ideal for cooking oils and fats. These are not meant to be used on Class B fires which include fires such as petrol, but there have been some manufacturers that have created wet chemical extinguishers with a Class B rating. Always check the Manufactures labels on the fire extinguishers before use. 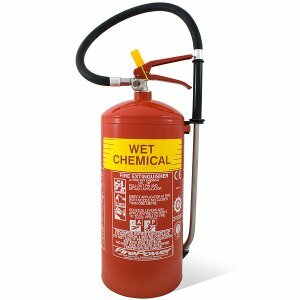 How do wet chemical fire extinguishers work? These work by creating a foamy layer over the surface of the burning material, this will then stop oxygen from fuelling the fire. It also has a cooling effect on the fire. What type of premises/business are these best for? As these are good with cooking oil fires and fats these are best in Commercial Kitchens and Canteens. All of the above extinguishers have directions to follow, so it is always good to familiarise yourselves with these instructions in advance to prevent a fire adequately. We have other topics for you to use in helping with your CSCS Revision. We have also prepared a fire extinguishers CSCS mock test for you to test your new knowledge on. Some great resources on this website that really helped me get my card, thank you for providing these for free. your are told that incase of fire, you should stop imediatly and go straight to the assembly point, unless you are a trained fire marshall. So why does everyone have to learn about the fire extinguishers. I have been a bricklayer for 36 years. I now have to keep paying every 5 years to prove i am competant. The fire extinguishers often change and are often the failure point for people failing their CSCS test. It is still better to know than not know. One time you might not have a choice not to use one and it will be best to know which one to use.